At the end of September an Arctic Redpoll was found on Unst, the northernmost of the inhabited Shetland Isles. This was followed by news late on the 30th of a Pechora Pipit, a new bird for my British list, in the same area. Also a Bonapart’s Gull, a small north American gull, had been seen although the finder and the exact location couldn’t be established. Paul needed the Bonapart’s for his Shetland list so opted to take a days leave and go with me. Incidently, Bonapart’s Gull was not named in honour of Napoleon, but after his nephew. We left pretty early and arrived about 0900 to find a crowd of 30+ birders watching the Arctic Redpoll. Apart from being a year tick, I have never this race, hornemanni anywhere in the world. The species Arctic Redpoll consists of two subspecies, exilipes which is circumpolar in the Arctic except for Greenland and Baffin Island where it is replaced by the larger hornemanni which is almost as big as a Chaffinch..
Those, who for whatever reason, choose is ignore the huge volume of evidence that all species have evolved from an earlier form, often quote the supposed lack of intermediates to support their case. They need to look no further than the redpolls to see a species group where the evolution of species is still in progress (or crossbills, large white-headed gulls, the yellow wagtail group, slaty antshrikes or Darwin’s finches for that matter) . Exilipes and hornemanni could be regarded as separate species, but the population in Iceland might be a hybrid swarm between hornemanni and the large rostrata race of Common Redpoll and exilipes might hybridise with the nominate race of Common Redpoll elsewhere. As Greenland and Baffin Island are hardly easy places to conduct long-term studies, hybridisation between exilipes and hornemanni could also occur, thus the relationships between all six races in the redpoll complex remains unresolved. Whatever the taxonomic position of hornemanni there is no denying that this was a most beautiful individual. The five ‘northwestern’ Redpolls, i.e. probable rostrata that I had seen on my last visit had now increased to over 20 and provided a good comparison with the hornemanni. The other good bird, Pechora Pipit, was much harder to see. A vagrant from arctic Siberia, this species is hardly ever recorded in the UK away from Shetland. Not only is it rare but it is skulking and although I eventually got half a dozen flight views (some of them quite good) I never saw it perched. Whilst I was hanging around Northwick, Paul toured the area looking for the Bonapart’s Gull but to no avail. I joined him later in the day and was pleased to see a flock of 46 Snow Bunting on Lamba Ness. Snow Buntings reach Shetland from both the Icelandic and Scandinavian breeding populations. Judging by the dark rumps of the birds in flight this group is from Iceland. Part of the flock of 46 Snow Buntings. Unlike my last visit to Unst, the day had been grey with heavy showers, however the sun breaking through the clouds at Lamba Ness produced this dramatic scene. On our way home we stopped at Brae and had good views of the Surf Scoter that I first saw last week. It had moved away from Burra Voe and was much closer, although still too far for photos. 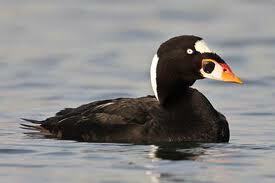 Male Surf Scoter. Photo from the internet. Finally we stopped at Voe, where a Spotted Sandpiper had been seen, it was found on the banks of a stream, but Paul had an appointment at 1800 and we couldn’t linger for photographs. Spotted Sandpiper is the American equivalent of our Common Sandpiper. This bird was photographed at Lyme Regis in Dorset in January 2012. Sign on a gate at Voe. Clearly THE place to be on a Saturday night. « Shetland update 4 – a few more pictures from the last week.